Welcome back for the second tutorial this month. Here is the first tutorial using the tiny border cutaway. This month I am focusing on using the tiny border cutaways that come in Essentials: Audrey Cutaways. On my first tutorial I die cut the tiny border cutaway from the set , trimmed it down and used as a layer over colour washed background. In this tutorial, I am using the xoxo border cutaway from Essentials: Audrey Cutaways set to make a cover model plate. The Essentials: Audrey Cutaways is a versatile die set. There are so many dies in this set that it is worth the investment. 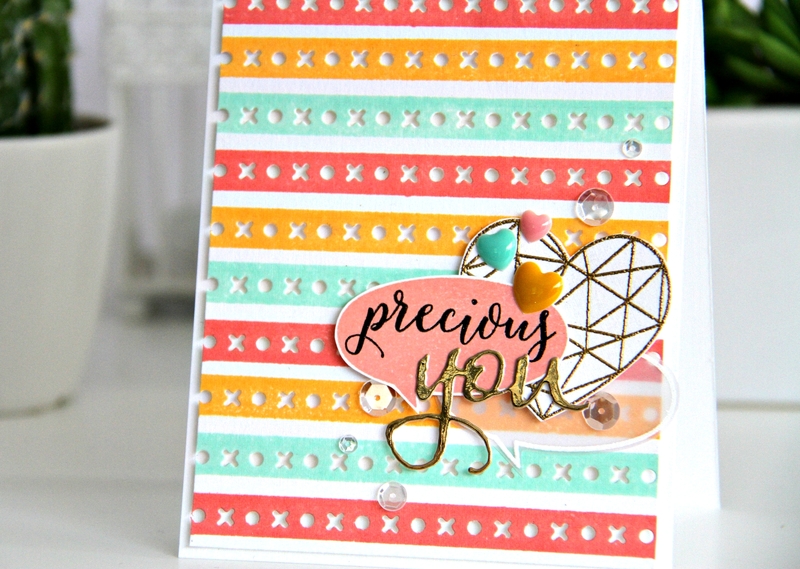 In today’s tutorial, I have used the “xoxo” border die in the set to make your own cover plate. A started with trimmed a cardstock to 4” x 5 ¼” in size and drew lines horizontally at equal intervals with a pencil. This pencil lines helped me line up the border die while die cutting. After lining up and running through my cuttlebug, I ended with a cover plate with “xoxo” on it. To make this cover plate more interesting, I used the medium striped stamp from Scenery: Stripes stamp set and dye inks and stamped over the die cut on the panel. I chose three colours that matched well with each other. This time I chose to go with dye ink for only one reason - I was able to see through the inked stamp to line up and stamp. Pigment ink makes the inked stamp opaque making it difficult to see through the stamp to line up. I really loved how my cover plate panel looked now with the colourful stripes. I mounted this panel to a white card base using foam adhesives. For the focal point, I gold heat embossed and cut out the heart from True stamp set. I also had couple of speech bubbles from Bubble Talk stamp set already with me. One speech bubble is white heat embossed on vellum and the other stamped using Fresh Peach ink and cut out. On the peach speech bubble, I stamp the sentiment “precious” from My Precious stamp set in black. I clustered the speech bubbles and golden heart and adhered using foam adhesive. I then die cut “you” from The Big, the Bold and You Cutaway in gold foil cardstock and adhered below the stamped sentiment. Finally I added three heart shaped enamel dots and Sparkly Clear sequins from Pretty Pink Posh to bring the card together. You can do anything over the cover plate to make it your own – sponge inks, watercolour, stamp images… It is up to your liking. Or you can also sponge ink on the card front and layer the cover plate panel. Hope you like my cover plate idea using the tiny border dies from Essentials: Audrey Cutaways. Fabulous, Gayatri!!! Yep... still yearning for Audrey's! I DO like your coverplate idea. Looks fabulous! LOVE this, Gayatri, fabulous, creative use of the Audrey Cutaways! So pretty, Gayatri! I feel a case coming on! SO CLEVER and SO PRETTY!!! LOVE your repeat die cutting Gayatri, LOVE the colour combo for your inky stripes too!!! WOW - so much amazing beauty on one card - love the technique and the tips you shared!! Wonderfully and awesomely done!! !